Everyone has different standards of neatness. That’s true in the garden as well as in the house. Gardens that look weedy to one person, may look pretty tidy to another. But personal standards aside, there are some good reasons to keep weeds under control. They can shade or crowd the plants you’re actually cultivating, compete for valuable moisture and nutrients, and if allowed to go to seed, they will make sure you have even bigger weed problems in the future. Weeding is a chore gardeners can’t avoid. But you can decrease the amount of time you spend doing it and that’s a benefit everyone can appreciate! Tulips bloom early and so do dandelions. 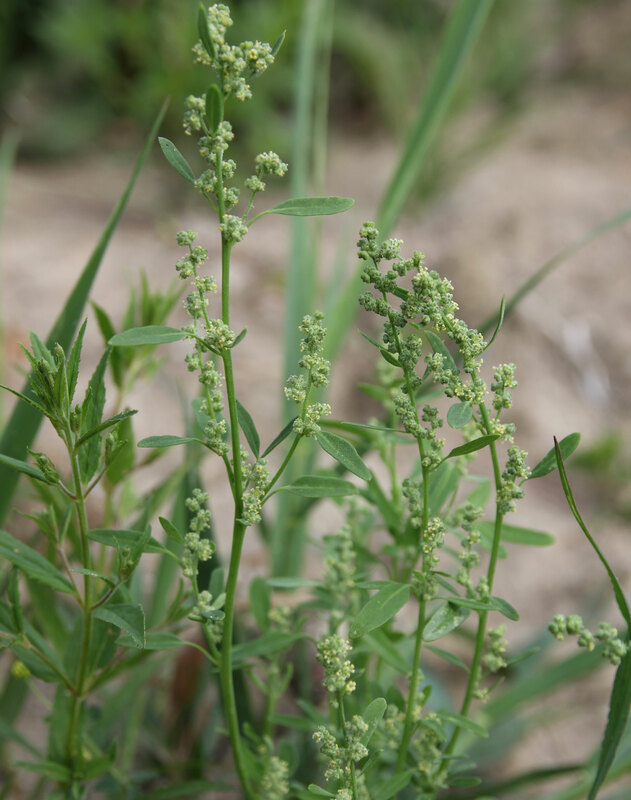 Remove this weed quickly before it can produce seeds and spread them far and wide. And while you’re at it, get after that grass and creeping Charlie, too! The time to start managing weeds is very early spring. 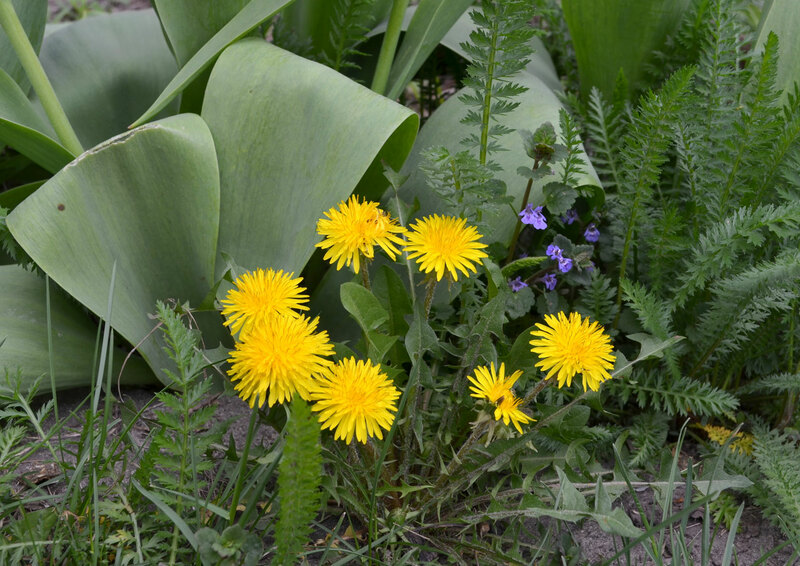 Difficult perennial weeds like dandelions are able to grow in surprisingly cold soil. If you get them out while the soil is still moist and before they are in active growth mode, it’s easier to remove them, roots and all. As the soil warm up, annual weed seeds start to germinate. In most areas of the country, weed pressure is greatest in the spring and this is a critical time to assert your dominance. Weed weekly to remove these plants while they are still small. You’ll be surprised how quickly this can be done when the plants are young and tender. Mid-summer usually brings drier weather and that means not quite so many weeds – especially if you are employing some of the other weed control techniques listed below. 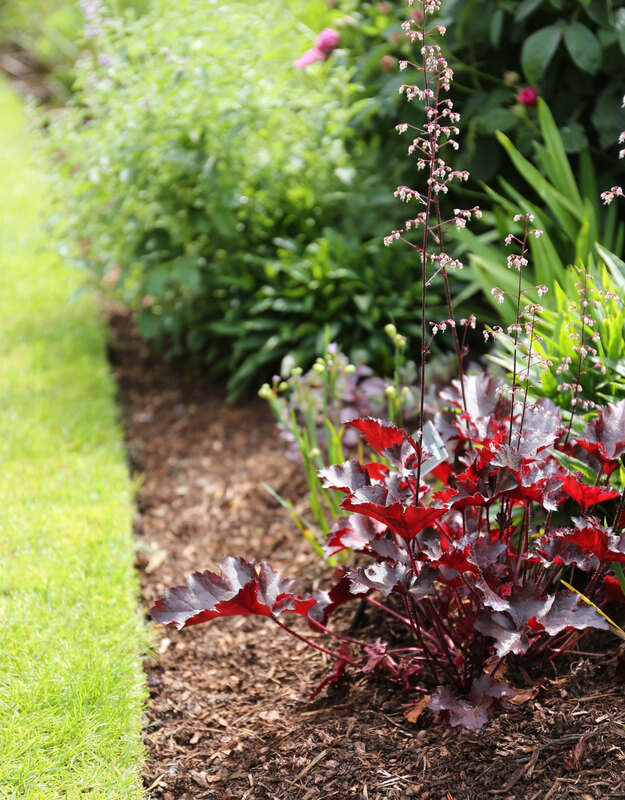 Maintain your weekly weeding routine and enjoy the pleasure of a tidy garden! Starting a new garden area? Don’t despair! 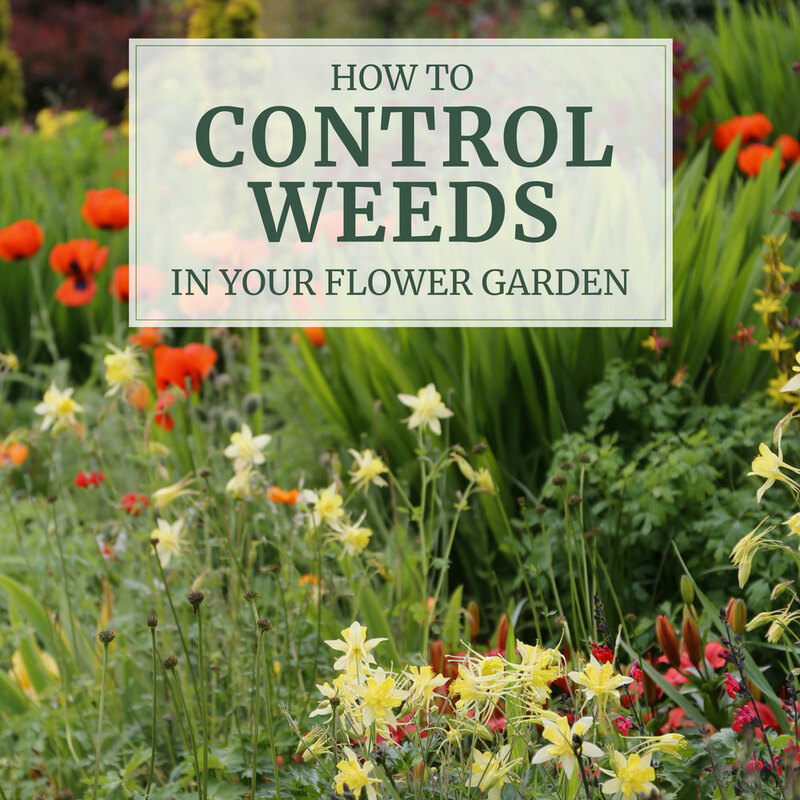 Controlling weeds can be very difficult for the first couple years. As you turn the soil and shape new garden beds, you are bringing weed seeds up to the surface where there’s enough light for them to germinate. Plus, all that freshly exposed soil is like a red carpet for airborne weed seeds (dandelions!) as well as invasive creepers (creeping Charlie!). The weed known as nettleleaf goosefoot going to seed. The key to long term weed control is vigilance. Make it your goal to let no weed go to seed. A single plant can produce hundreds or even thousands of seeds that will be around to plague you in the months and years to come. Some weeds inevitably go unnoticed until they start flowering. Whenever and wherever you find these rascals, be swift about removing them – especially the flower heads. Weeds have an uncanny ability to go from flower to seed in a blink of the eye. 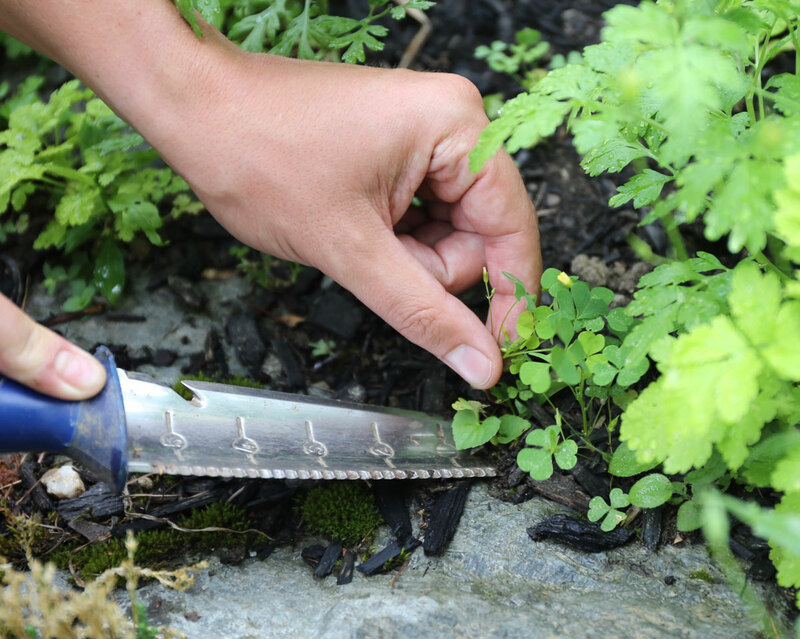 The tool known as a hori-hori can be used for digging out weeds as well as for planting. Dig only when you need to dig. Most soils are filled with weed seeds that can remain dormant for decades. Digging brings these seeds to the surface where there is enough light for them to germinate. When you’re weeding, it’s important to remove the roots, but when you do, try to disturb the soil as little as possible. Mulch has many benefits, and one of the big ones is weed suppression. Covering the soil with a 2” layer of fine-textured mulch (shredded leaves, compost or ground bark mulch) deprives weed seeds of light and will drastically reduce the number of them that can germinate. 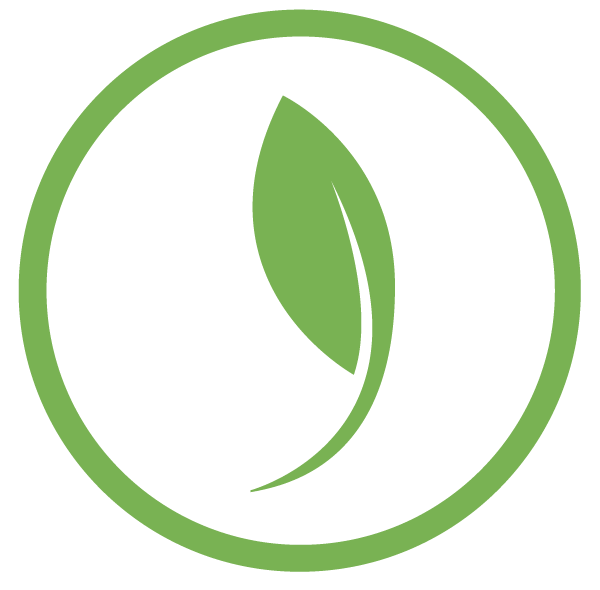 Organic mulches improve the soil as they break down and also help to conserve soil moisture. You and your plants will receive many benefits from this one activity. Weeds love overhead sprinklers because they don’t discriminate. Weeds get just as much water as flowers. To keep weeds in check, focus water on desirable plants and avoid wetting nearby surfaces where weed seeds lie in wait. 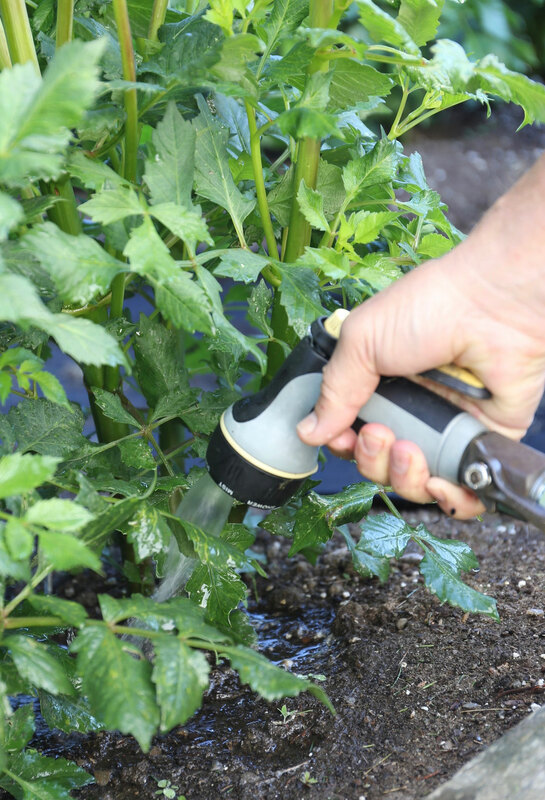 Though it’s enjoyable to water with the “sprayer” setting on your hose nozzle, consider turning the dial to jet or soaker instead. Adding a wand will let you direct water to specific plants without bending over. Give weeds an inch and they’ll take a foot. 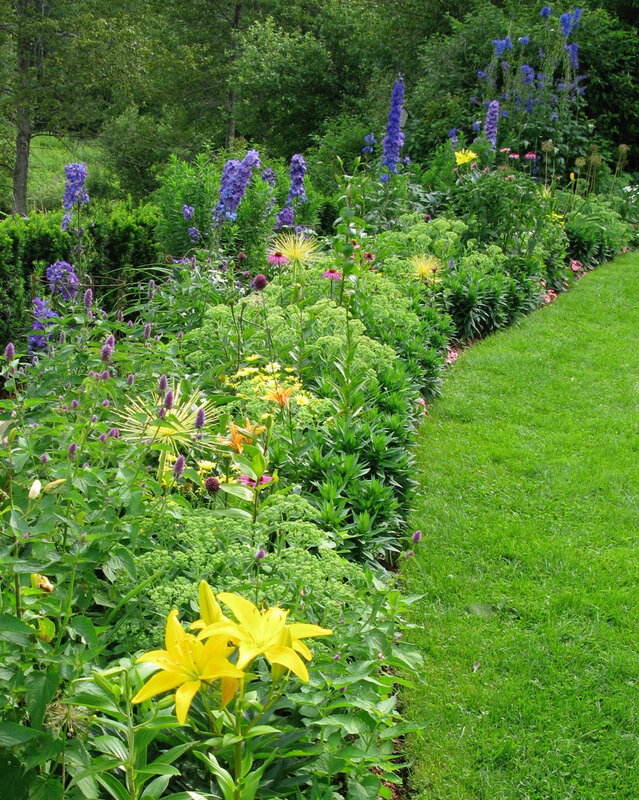 To keep them from getting started, strive for flower beds that are nice and full — just short of crowded. The fuller they are, the more completely the foliage will shade the soil surface. And without light, most weed seeds won’t germinate. Aim to have the foliage of one plant just touching the foliage of its neighbor. For more tips about tending a flower garden, you may be interested in reading: How to Water Your Plants and How and Why to Fertilize Your Plants. Wonderful weeding advice. Also weeding in early morning before sy 900am or whe8 you have shade and loose soil from the morning dew or recent rain is the best. You may have soggy feet but it makes the pulling easier. 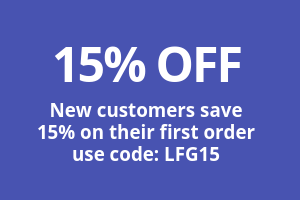 Hi Carol – good tip, thank you! I would love to know what lemon colored sunburst shaped flower is in the last picture? Is it a real flower or a spray painted seed head? Hi Annie – Those metal allium spheres have stumped many a savvy gardener who has visited my garden! I got them from gardeners.com many years ago. Just checked and unfortunately they don’t carry them any more. I repainted them last year and now they’re lime green. I’m not big on accessorizing the garden with do-dads, but they are a fun accent for that long border. How does one control Bind Weed ? Hi Roger – I can tell you how I have managed to control bindweed: with very careful spot applications of Roundup. I don’t like using it, but have found nothing else that works. I had bindweed in my asparagus bed and it took 3 years to completely eradicate it. I started by digging out as much as I could. Then, I spent the entire growing season searching out every bit of vine. Always work on a sunny day for best effect. To minimize soil contact, I would put pieces of newspaper or plastic on the soil surface and then stretch the vines over the top. Wearing heavy gloves and using a paint brush and small container of weed killer, I would generously painted the leaves and then leave the vines in the sun for a day. I am always on the look out for it in all of my gardens and attack it immediately with this same treatment. So far, I have managed to stay on top of it. But bindweed has infested a large wild area nearby. We selectively spray the edge that faces us a couple times a year to try and keep it back. Good luck.